Sedona, Arizona is known for it's beautiful red rock. Over millions of years, layers of sandstone and limestone were left in the area by a receeding ocean. Iron oxide eventually covered the grains of sandstone and, in a natural process, rust formed. The stunningly beautiful red rocks of Sedona are the result of this process. I've never seen spirals like this anywhere else. Notice the red rock spirals against the white cliffs in the background and steel gray sky. Like Mt. Shasta, Sedona is famous for it's vortexes. The vortexes of Sedona are believed to be spiritual locations where the energy is right to facilitate prayer, mediation and healing. Vortex sites are believed to be locations having energy flow that exists on multiple dimensions. The energy of the vortexes interacts with a person's inner self. It is not easily explained. Obviously it must be experienced. PaulB's Pointillistic/Impressionist original oil paintings of Arizona and various prints and poster formats of a wide variety of subject matter by the Pointillistic/Impressionist oil painter from landscape/waterscape paintings, dance, sports, portrait, to classical figures, flowers, rock and roll, Brazil, and Arizona paintings and prints are available for purchase for as little as $24.95 for an 8" x 10" matted print on photo pape. 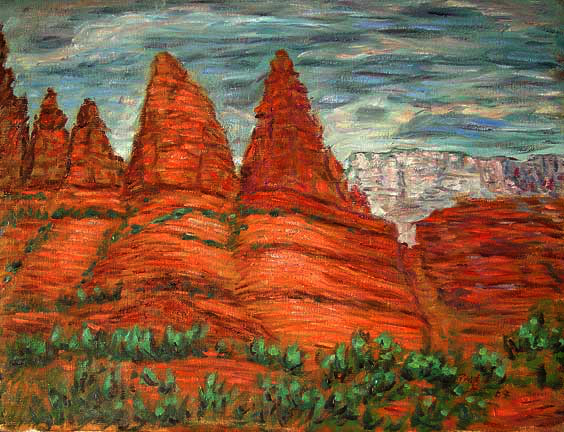 Pointillistic/Impressionist Giclee prints of Arizona on real canvas or heavy watercolor paper are available. One of a kind Arizonaan embellished prints, which are Giclee prints retouched in genuine oil paint by PaulB. Unless noted PaulB's original Pointillistic/Impressionist oil paintiings are oil on canvas. Paul Berenson's pointillistic/Impressionist oil paintings are in privale collections around the world, including the downtown Los Angeles Athletic Club and have appeared in numerous publications, including the New York Philharmonic Playbill. PaulB.com also builds websites and PaulB is a member of the LA Web Professionals Group.